Advertising space is available for Second Life based businesses, locations, websites and events. 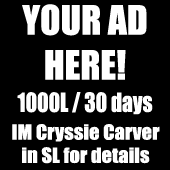 *Side bar advertising space is 1000L per 30 days. This is non negotiable and is the same price for all advertisers renting a spot. Any image used for advertising purposes must be a 170 x 170 pixels and will be placed on the top right hand side of the blog. Images must be in the form of either a .jpg or .png. If you plan to place a moving advertisement then .gif is acceptable also. Your advertisement will be linked to the URL of your choice. This can be a SURL to an in-world location, a blog, a marketplace store, etc. I currently receive between 150 - 300 unique blog hits per day. As this hopefully increases I will update these figures to reflect that. This blog is promoted on all the social media sites on the buttons at the top of this page. Days I blog receive more hits than days I do not and I aim to blog at least 3 times a week, although it is usually more. If the black and white 'Your Ad Here' sign is not on my page then there are currently no advertising spots available.